The idea of placeshifting live and recorded cable and satellite TV—that is, viewing the content on a display other than the one the box is connected to—is less novel than it was several years ago, let alone just a couple when Slingbox’s last models debuted. Today, those who haven’t yet “cut the cord” can access many of their favorite channels and shows on portable devices with a login and code, and some services even let you access live TV or your DVR’s contents on the go. That said, the Slingbox M1 works indiscriminately, regardless of which channel or show you’re watching, or which provider you’re shelling out gobs of cash to each month. It’ll stream anything, including sports, which sometimes fall under restrictions that keep them out of certain apps or markets. And best of all, it’s incredibly easy to use. The M1 is Slingbox’s first new offering in nearly two years, and it’s not only the lowest-priced version to date, but also the most capable entry-level model. You can push live TV, DVR recordings, and even on-demand programming to your computer, smartphone, tablet, or compatible set top box—even if you’re far away from home. No HDMI, but all the other connections you'd want, and built-in Wi-Fi. The basic, streamlined design of the M1 is much more appealing than the garish and glossy pattern of the previous starter option, the Slingbox 350, and it’ll fit subtly into your entertainment center. Also unlike that earlier box, the M1 offers built-in Wi-Fi connectivity, which makes it even easier to get set up and start shifting the signal between devices. 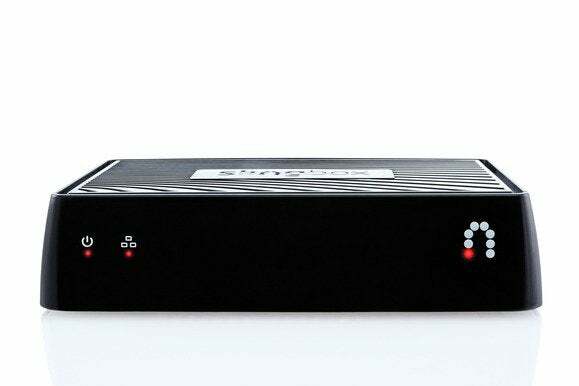 You’ll need to run component or composite cables from your cable or satellite box—or alternately a DVR, Blu-ray or DVD player, or even security camera, if desired—to the Slingbox, as the M1 lacks HDMI ports. It’s an odd omission on the surface, especially since the pricier SlingTV—that’s the rechristened Slingbox 500 that was also announced Thursday—has HDMI ports, but HDCP copy protection restrictions actually make component a better choice for most source types. Still, the option would have been appreciated. The SlingPlayer apps for phone and tablet (this is the iPad version) can finally be used to set up your M1. It takes mere minutes to get up and running via a computer—or from a phone/tablet, a new and welcome option—and then you are free to take that signal to other devices. Want to watch a big sports match on your phone or tablet, whether that’s on the back porch or on the train? Go for it. Hoping to watch some shows recorded on your living room DVR, via an Apple TV or Roku connected to the TV in your bedroom? No sweat—you’ll need one of the mobile or tablet apps to transfer to the video to a set-top box, but once started, you can exit the apps without killing the feed. The native Mac app works great. With a solid Wi-Fi connection, the video quality is rather impressive. During testing on an Apple TV, the 1080p signal on my 46-inch LCD was nearly as crisp as watching live TV, and it never stuttered. You’ll sacrifice a bit of clarity on a tablet or phone, and perhaps also on a laptop depending on specs, but so long as your Internet connection is reliable, you can expect a great image with very rare blips in the action. Tapping into a weak Wi-Fi signal or switching to LTE brings noticeable changes—a fuzzier image and potential pauses, which is the same as viewing any kind of Internet video. As someone new to using Slingbox, what surprised me is how effortlessly something this seemingly complex functions in daily use. Sling used to rely on browser plug-ins to allow computer viewing, but now comes with a native PC or Mac app that is very streamlined and easy to use, while the iPhone, iPad, and Android apps feature a largely similar-looking UI that’s best suited to each device’s dimensions. For example, you can see the large remote facsimile on a tablet, while a phone screen just shows the necessary quick controls to help you maneuver through menus. Watching on an iPhone and an iPad will run you $30 in extra app charges total. Curiously, however, the mobile and tablet SlingPlayer apps are all sold separately for $15 apiece—even iPhone and iPad don’t share a single universal app. Sure, some users may not need mobile or tablet access, or even the ability to use one of those apps to send video to an Apple TV or Roku. But with how prolific tablets and smartphones are today, only allowing access via traditional computers out of the box (without paying extra) comes off as archaic. On any platform, the SlingPlayer experience is straightforward enough to pick up on without needing to dig into tutorials and help—but be prepared for how sluggish flipping through menus can be. In my testing, it took a few seconds after pressing a button to see a result, which makes even scrolling through a DVR list a laborious process. And the live TV signal freezes up with each such input, which might make you hesitant to poke around too much. Wonderful as it is to be able to control your cable box from afar, that side effect proves frustrating at times. Modern cable and satellite services may be chipping away at Slingbox’s once-totally distinctive feature set, but the M1 proves a great entry-level option for placeshifting live and recorded TV without undue restrictions.